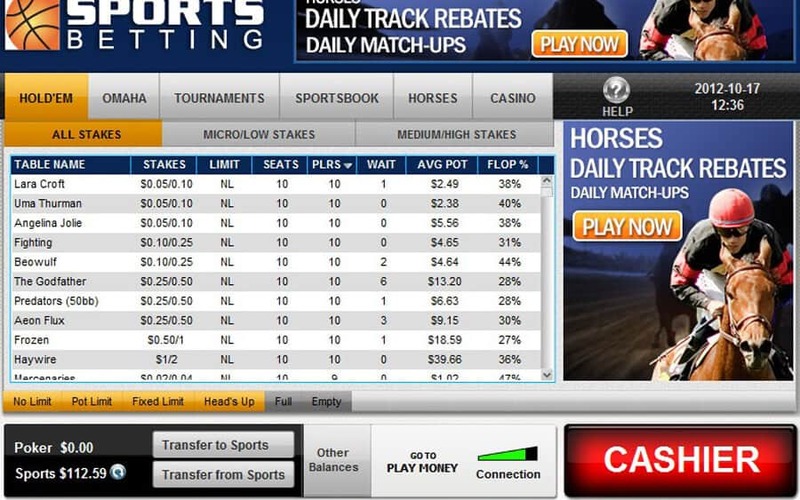 SportsBetting Poker Site Review - Bonus Up To $2500 FREE! Visit Sportsbetting Get Your Bonus! SportsBetting is based in Latin America's banking capital. Safe and secure gameplay Operates according to the laws of Panama City, Panama. SportsBetting Poker also promotes responsible gambling. Instant deposits and withdrawals in as little as 24 hours. ? All legitimate, real-money poker sites like SportsBetting Poker have strict anti-fraud screens, and that may create a short withdrawal delay. Make your first deposit and SportsBetting Poker will match it 200% up to $2500. You earn your bonus simply by signing up and making your first deposit. ? Please read the terms and conditions carefully. Don't let the name confuse you, there's much more than just sports betting on offer at this premium gambling site. Aside from an impressive roster of sports, you can enjoy horseracing bets, a full-fledged casino with live dealer tables, and plenty of action in the poker room. If SportsBetting Poker looks at all familiar that's probably because the site is operated by BetOnline. Although SportsBetting can trace its roots back to 1998, the gambling site was acquired by the Panamanian gaming giant in 2013. While the casino proudly uses software from BetSoft, the poker room operates on the Chico network. US players are free to enjoy all areas of the site including the popular poker room. 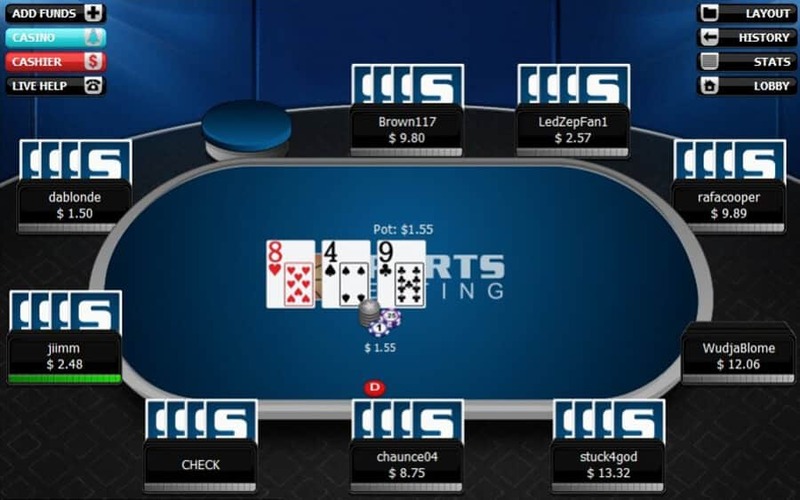 The SportsBetting Poker game client isn't particularly flashy, but it more than makes up for it by being stable, visually clean, and compatible with most operating systems. You'll find downloadable versions for Windows and Mac. Whether you prefer playing on a laptop or desktop, you can download and install the software in a couple of minutes. We found the layout of the lobby to be intuitive. It's always simple to find games that meet your schedule and budget. You can count on all the usual features like the ability to chat with players, check your game stats, and review your hand history. If you've ever felt impatient waiting for your turn while playing poker, our SportsBetting review team has some good news. The site lets you enjoy more than one hundred slot machines and table games while your game is in progress. It's easy to share your bankroll between the various areas of the site, but you can also enjoy free games if you prefer. SportsBetting Poker's generosity is on full display before you even sign up. We've already mentioned the impressive 200% deposit bonus, but there's much more. New players get an entry into a $5K freeroll. Like most card rooms, SportsBetting Poker lets you earn points when playing for real cash. Once you rack up enough comp points, as they are called, you'll be able to buy your way into real money tournaments without dipping into your wallet. Poker fans who play regularly will have plenty of opportunities to earn extra cash. The card room gives away $10,000 every week in a leaderboard contest, and that's on top of the cash you can win while playing. You'll love the competitive spirit almost as much as the money. You aren't limited to playing cash games and tournaments at your home or office. 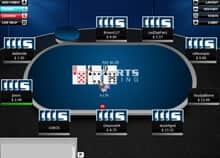 SportsBetting Poker supports both iOS and Android. If you have an Android smartphone or tablet, you can download and install an app directly from the gambling site's mobile landing page. iPad and iPhone users will be able to take advantage of special instant play games that work right in Safari. You don't need the latest hardware either. Our SportsBetting Poker mobile review team found that the performance was more than adequate on smartphones that were several years old. You will need a steady internet connection, but it doesn't have to be particularly fast. It doesn't make a difference if you prefer ring games or tournaments, you won't have trouble finding a seat. The only downside is that you are generally limited to Texas hold'em, Omaha, and Omaha hi-lo. This might disappoint players who crave more obscure variations, but it should satisfy most card players. As far as tournaments go, you'll find no-limit action and lots of guaranteed events. The site is most famous for its $100K events every weekend. If you can't wait, there are always sit and go tourneys. The best part is you can find games at a wide range of stakes. With frequent satellites, you can afford to make your way to big events. The poker room has a solid player pool for a site that's available in the USA. At one point, we spotted more than 1200 players online. What's even better is that the competition isn't exactly fierce. It's quite common for SportsBetting players who have recently won a basketball bet or slot machine jackpot to bring their newfound cash to the Texas hold'em tables. As you might expect, these players aren't hard to beat. If you've spent even a little time trying to master the game, their cash could soon be yours. It's easy to play for real money at SportsBetting Poker. The cardroom welcomes every payment method you would want. Fund your account using Visa, MasterCard, American Express, Skrill, bitcoin, litecoin, bank wire, check or money order by courier, person to person, and book to book. Fortunately, the site operates in US funds so you won't have to deal with currency conversions. 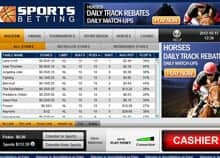 Our SportsBetting Poker review team was pleased to discover that the gambling site makes it easy to claim your winnings. Although withdrawals by credit card aren't available at this time, you can cashout quickly using many of the deposit methods we mentioned earlier. In our tests, the site beat their published withdrawal speeds of 24-48 hours, which is the average for most methods. The only drawback is that you may pay a small fee when claiming your winnings using some methods, although free options are available. Fantastic customer service is never more than a call or click away no matter what time it is. It's easy to reach a knowledgeable agent who speaks English using the toll free number, by live chat, or by email. Whether you have questions about signing up, banking, software installation, or anything else, you'll never be left wondering. With generous bonuses, rewarding promotions, no-nonsense software, mobile compatibility, and great customer service, SportsBetting Poker is definitely worth more than a look. While there isn't as much traffic as some of the bigger name sites, the poker room does continue to grow. More importantly, it's one of just a handful of sites that are available to American players. Join SportsBetting now and claim a 200% bonus up to $2500!